For other senses of this word, see atoll (disambiguation). An atoll ( /ˈætɒl/, /ˈætɔːl/, /ˈætoʊl/, /əˈtɒl/, /əˈtɔːl/ or /əˈtoʊl/), sometimes called a coral atoll, is a ring-shaped coral reef including a coral rim that encircles a lagoon partially or completely. There may be coral islands or cays on the rim. (p60) The coral of the atoll often sits atop the rim of an extinct seamount or volcano which has eroded or subsided partially beneath the water. The lagoon forms over the volcanic crater or caldera while the higher rim remains above water or at shallow depths that permit the coral to grow and form the reefs. For the atoll to persist, continued erosion or subsidence must be at a rate slow enough to permit reef growth upward and outward to replace the lost height. More modern definitions of atoll describe them as "annular reefs enclosing a lagoon in which there are no promontories other than reefs and islets composed of reef detritus" or "in an exclusively morphological sense, [as] a ring-shaped ribbon reef enclosing a lagoon". Nukuoro from space. Courtesy NASA. Los Roques Archipelago in Venezuela, the largest marine National Park in Latin America, from space. Courtesy NASA. Most of the world's atolls are in the Pacific Ocean (with concentrations in the Tuamotu Islands, Caroline Islands, Marshall Islands, Coral Sea Islands, and the island groups of Kiribati, Tuvalu and Tokelau) and Indian Ocean (the Atolls of the Maldives, the Lakshadweep Islands, the Chagos Archipelago and the Outer Islands of the Seychelles). The Atlantic Ocean has no large groups of atolls, other than eight atolls east of Nicaragua that belong to the Colombian department of San Andres and Providencia in the Caribbean. Reef-building corals will thrive only in warm tropical and subtropical waters of oceans and seas, and therefore atolls are only found in the tropics and subtropics. 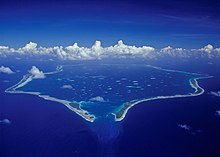 The northernmost atoll of the world is Kure Atoll at 28°24′ N, along with other atolls of the Northwestern Hawaiian Islands. The southernmost atolls of the world are Elizabeth Reef at 29°58′ S, and nearby Middleton Reef at 29°29′ S, in the Tasman Sea, both of which are part of the Coral Sea Islands Territory. The next southerly atoll is Ducie Island in the Pitcairn Islands Group, at 24°40′ S. Bermuda is sometimes claimed as the "northernmost atoll" at a latitude of 32°24′ N. At this latitude coral reefs would not develop without the warming waters of the Gulf Stream. However, Bermuda is termed a pseudo-atoll because its general form, while resembling that of an atoll, has a very different mode of formation. While there is no atoll directly on the equator, the closest atoll to the Equator is Aranuka of Kiribati, with its southern tip just 12 km north of the equator. Ardasier Bank 7°43′N 114°15′E﻿ / ﻿7.71°N 114.25°E﻿ / 7.71; 114.25 Spratly Islands 2,347 Cay on the south side? In most cases, the land area of an atoll is very small in comparison to the total area. Atoll islands are low lying, with their elevations less than 5 meters (9). Measured by total area, Lifou (1146 km2) is the largest raised coral atoll of the world, followed by Rennell Island (660 km2). More sources however list as the largest atoll in the world in terms of land area Kiritimati, which is also a raised coral atoll (321.37 km2 land area; according to other sources even 575 km2), 160 km2 main lagoon, 168 km2 other lagoons (according to other sources 319 km2 total lagoon size). The remains of an ancient atoll as a hill in a limestone area is called a reef knoll. The second largest atoll by dry land area is Aldabra with 155 km2. The largest atoll in terms of island numbers is Huvadhu Atoll in the south of the Maldives with 255 islands. Map from Charles Darwin’s 1842 The Structure and Distribution of Coral Reefs showing the world’s major groups of atolls and coral reefs. In 1842, Charles Darwin explained the creation of coral atolls in the southern Pacific Ocean based upon observations made during a five-year voyage aboard HMS Beagle from 1831 to 1836. Accepted as basically correct, his explanation involved considering that several tropical island types—from high volcanic island, through barrier reef island, to atoll—represented a sequence of gradual subsidence of what started as an oceanic volcano. He reasoned that a fringing coral reef surrounding a volcanic island in the tropical sea will grow upward as the island subsides (sinks), becoming an "almost atoll", or barrier reef island, as typified by an island such as Aitutaki in the Cook Islands, Bora Bora and others in the Society Islands. The fringing reef becomes a barrier reef for the reason that the outer part of the reef maintains itself near sea level through biotic growth, while the inner part of the reef falls behind, becoming a lagoon because conditions are less favorable for the coral and calcareous algae responsible for most reef growth. In time, subsidence carries the old volcano below the ocean surface and the barrier reef remains. At this point, the island has become an atoll. Atolls are the product of the growth of tropical marine organisms, and so these islands are only found in warm tropical waters. Volcanic islands located beyond the warm water temperature requirements of hermatypic (reef-building) organisms become seamounts as they subside and are eroded away at the surface. An island that is located where the ocean water temperatures are just sufficiently warm for upward reef growth to keep pace with the rate of subsidence is said to be at the Darwin Point. Islands in colder, more polar regions evolve toward seamounts or guyots; warmer, more equatorial islands evolve toward atolls, for example Kure Atoll. Reginald Aldworth Daly offered a somewhat different explanation for atoll formation: islands worn away by erosion, by ocean waves and streams, during the last glacial stand of the sea of some 900 feet (270 m) below present sea level developed as coral islands (atolls), or barrier reefs on a platform surrounding a volcanic island not completely worn away, as sea level gradually rose from melting of the glaciers. Discovery of the great depth of the volcanic remnant beneath many atolls such as at Midway Atoll favors the Darwin explanation, although there can be little doubt that fluctuating sea level has had considerable influence on atolls and other reefs. Coral atolls are also an important place where dolomitization of calcite occurs. At certain depths water is undersaturated in calcium carbonate but saturated in dolomite. Convection created by tides and sea currents enhance this change. Hydrothermal currents created by volcanoes under the atoll may also play an important role. In 1896, 1897 and 1898, the Royal Society of London carried out drilling on Funafuti atoll in Tuvalu for the purpose of investigating the formation of coral reefs to determine whether traces of shallow water organisms could be found at depth in the coral of Pacific atolls. This investigation followed the work on the structure and distribution of coral reefs conducted by Charles Darwin in the Pacific. The first expion in 1896 was led by Professor William Johnson Sollas of the University of Oxford. The geologists included Walter George Woolnough and Edgeworth David of the University of Sydney. Professor Edgeworth David led the expion in 1897. The third expion in 1898 was led by Alfred Edmund Finckh. Aerial overview of the Wake Island atoll, part of the Pacific Remote Islands Marine National Monument. ^ "atoll". Dictionary.com Unabridged. Random House. ^ Blake, Gerald Henry, ed. (1994). World Boundary Series. Google books. 5 Maritime Boundaries. Routledge. ISBN 978-0-415-08835-0. Retrieved 12 February 2013. ^ Migoń, Piotr, ed. (2010). Geomorphological Landscapes of the World. Springer. p. 349. ISBN 978-90-481-3055-9. Retrieved 12 February 2013. ^ Erickson, Jon (2003). Marine Geology: Exploring the New Frontiers of the Ocean. Facts on File, Inc. pp. 126–128. ISBN 0-8160-4874-6. ^ Darwin, Charles R (1842). The structure and distribution of coral reefs. Being the first part of the geology of the voyage of the Beagle, under the command of Capt. Fitzroy, R.N. during the years 1832 to 1836. Darwin Online. London: Smith Elder and Co.
^ McNeil (1954, p. 396). ^ Fairbridge (1950, p. 341). ^ "Archipiélago de Los Roques" (in Spanish). Caracas, Venezuela: Instituto Nacional de Parques (INPARQUES). 2007. Archived from the original on 2008-04-24. Retrieved 27 February 2013. ^ "Atoll Area, Depth and Rainfall" (spreadsheet). The Geological Society of America. 2001. ^ "Misinformation about Islands". worldislandinfo.com. ^ David, Cara (Caroline Martha) (1899). Funafuti or Three Months On A Coral Atoll: an unscientific account of a scientific expion. London: John Murray. ASIN B00A1YMOFO. ISBN 978-1-151-25616-4. ^ Finckh, Dr. Alfred Edmund (11 September 1934). "TO THE EDITOR OF THE HERALD". The Sydney Morning Herald. NSW: National Library of Australia. p. 6. Retrieved 20 June 2012. ^ Cantrell, Carol (1996). "Finckh, Alfred Edmund (1866–1961)". Australian Dictionary of Biography at Australian National University. National Centre of Biography. Retrieved 23 December 2012. ^ Rodgers, K A; Cantrell, Carol. "Alfred Edmund Finckh 1866–1961: Leader of the 1898 Coral Reef Boring Expion to Funafuti" (PDF). Historical Records of Australian Science. pp. 393–403. doi:10.1071/HR9890740393. Retrieved 23 December 2012. ^ "Presidential Proclamation 8336" (PDF). The White House. 6 January 2009. ^ "Weekly Compilation of Presidential Documents" (PDF). 12 January 2009. Archived from the original (PDF) on March 1, 2009. Fairbridge, R. W. 1950. "Recent and Pleistocene coral reefs of Australia". J. Geol., 58(4): 330–401. McNeil, F. S. 1954. "Organic reefs and banks and associated detrital sediments". Amer. J. Sci., 252(7): 385–401. Wikimedia Commons has media related to Atoll. NOAA National Ocean Service - What are the three main types of coral reefs?